It’s very important to some time spend with your partner before you go to sleep. It doesn’t matter how much time you have to spend together — an hour or just a few minutes. If it’s just the 2 of you enjoying each other, talking, and showing your love, that is all you need. Many couples don’t see each other all day long and have a habit of going to bed at different times. According to psychologist Curt Smith, happy couples brush their teeth together and go to bed at the same time. It helps them to maintain the warmth and intimacy of their relationship. Pay attention to each other’s feelings. You don’t need to give advice or find immediate solutions to problems. Sometimes we simply want to talk and feel the care and support of our loved ones. Psychologist Ryan Howes suggests dedicating a few minutes before going to sleep to expressing positive feelings to your partner. This will help end the day on a positive note and make you feel better. It also has a positive influence on your overall mood. Try to forget about everything that happened that day, and leave all your problems and concerns outside the bedroom door. Tell your partner how much you love him or her. It’s very important to be serious and sincere when you express your feelings. Switch your phones to silent mode and put them away. Social media dependency suppresses the release of oxytocin in your body. This hormone is responsible for emotional intimacy and bonding. Psychotherapist Carol Carey advises following a simple rule: turn off your phones, or put them away at 9 p.m. on the dot. Don’t argue or get into heated conversations. Curt Smith reminds us to try not to involve ourselves in heated arguments before going to sleep. Fighting in bed never helps to solve a problem. On top of that, it’s harder for both of you to fall asleep, and you’ll feel depressed the next day. Try to forget about work, and stop checking your work email when you are in bed. It’s so much better to spend that time together and to have some rest so you can be productive at work tomorrow. Pillow talk connects couples emotionally, helps you forget about problems, and makes you feel relaxed. Avoid talking about work, financial troubles, or anything else that could make your partner feel worried. Following the same bedtime routine every day helps you to sleep better. While following a familiar routine, your brain receives a signal of the approaching bedtime and prepares your body for sleep. If you follow the same routine together with your partner, it will make your relationship more intimate and trustworthy. If you suffer from insomnia, try to make a few changes to your lifestyle. Don’t snack before going to bed. Buying some beautiful and expensive bedding can help you fall asleep faster. Don’t nap on the weekends. Leave all gadgets outside your bedroom door. Let some fresh air into your bedroom. Take a hot bath before going to bed. Try not to work after 9 p.m.
Don’t drink too much water before going to sleep. Don’t forget about hugs and kisses. Don’t forget to kiss your partner before going to sleep as well as cuddling for a few minutes when you are already in bed. This is very relaxing and evokes positive emotions. Psychologists are confident that if you hug while falling asleep, your relationship is not in trouble. Specialists from the National Foundation of Sleep confirm that a light and relaxing massage before going to bed improves the quality of your sleep, reduces anxiety, and brings couples closer together. Don’t drink alcohol or smoke. Many couples like to have a glass of wine before going to bed to create a romantic atmosphere. However, while your body is digesting alcohol, the restorative period of your sleep becomes shorter. That will make you feel tired, distracted, and easily annoyed when you wake up in the morning. Alcohol also makes snoring likely and the nicotine in cigarettes promotes insomnia. Don’t share a bed with your pets. As reported by University of Kansas research, 63% of people who sleep with their pets don’t get enough sleep. Your pet can’t sleep through the night and often disturbs your sleep. 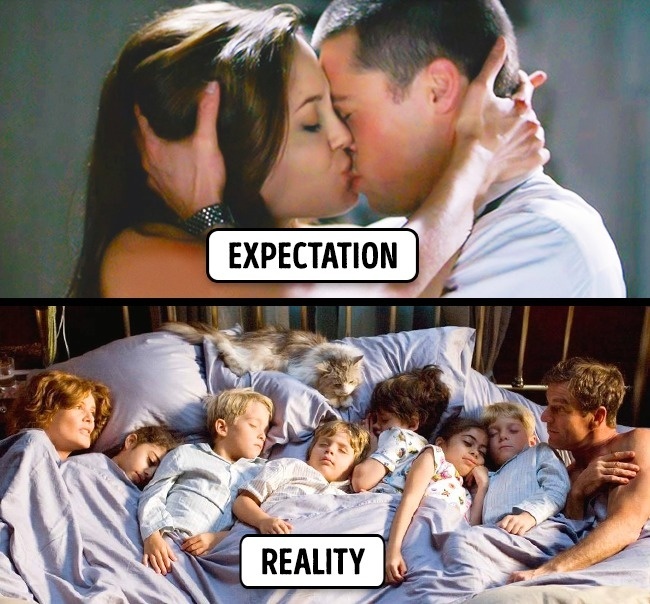 On top of that, having a pet in your bed violates “the rule of 2″ in your bedroom. 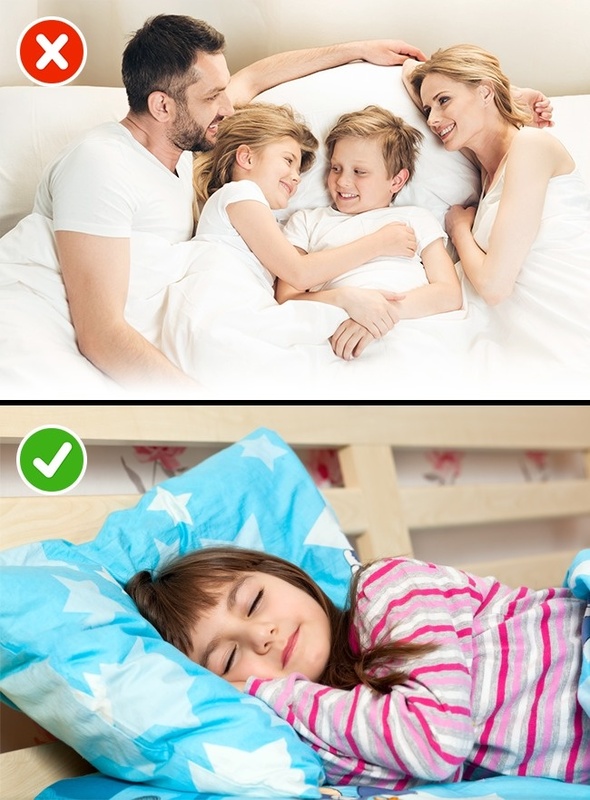 According to psychologist Michael Viner-Davis, the only time you can let your children sleep in your bed is when they have a nightmare. At all other times, your bedroom should be your private space. You need to have that space for the 2 of you to maintain your intimacy. Share this information with your friends & family and show the world that science has your back! Don’t forget comment below. Enjoy with your Life Partner ..! !